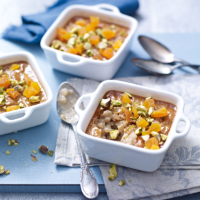 A delicate and fragrant rice pudding, lightly flavoured with Assam tea and Indian spices. 1. Preheat the oven to 150°C, gas mark 2. Place two teabags in a saucepan and pour over 150ml boiling water. Leave to infuse for 5 minutes, then lift out and discard the teabags. 2. Stir in the milk, rice, sugar, vanilla extract and cinnamon stick, and bring to a simmer. Pour the mixture into a 1-litre ovenproof dish and bake for 90 minutes until the rice is tender and the liquid absorbed. Stir and remove the cinnamon stick. 3 Scatter over the chopped nuts and apricots, and serve warm immediately, or leave to cool and chill until ready to serve.